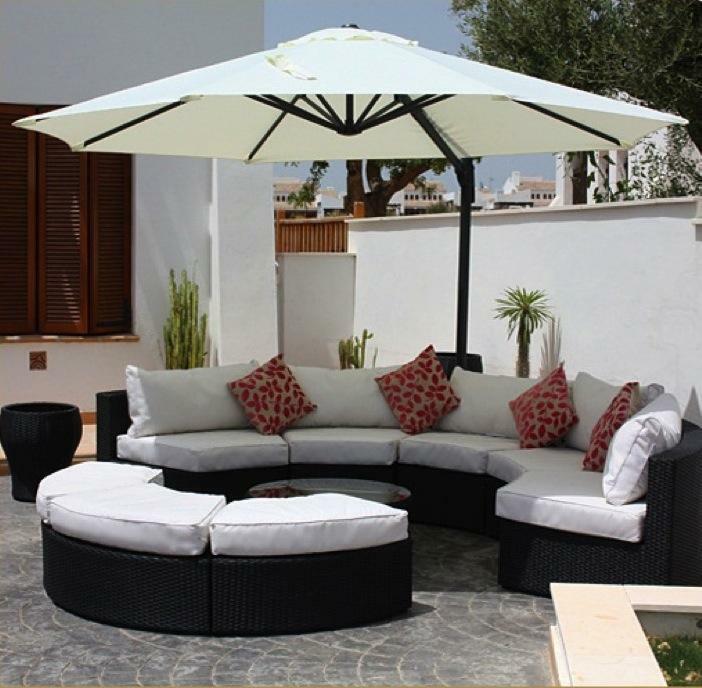 Over time, weather – good or bad – can do serious damage to your patio furniture. A little wind, a lot of precipitation and too many direct rays can all turn your expensive patio set into a ramshackle pile-o-rust. Protect your outdoor living space and prevent dirt, rot and rust with these simple steps. 1. Keep it clean. Even if your furniture is covered, it’s still going to accrue dirt and rot if you don’t clean it every once in a while. Pick a sunny day, and take the time to clean your furniture with mild dish soap and warm water. Use a sponge to break up grime and a hose to rinse away any soap residue. Note: If you have wrought iron furniture, your set is going to need special care to prevent rust. 2. Protect fabric. Cushions are invaluable for uncomfortable wicker or wrought iron chairs, but they’re sensitive and easily ruined by precipitation. To protect your fabric (upholstery or cushions), first give it a good wash with mild dish soap and warm water. Once the fabric is completely dry, spray it with fabric protector. 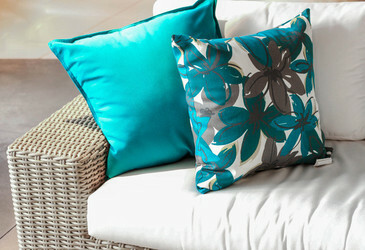 Tip: Spray a small piece of fabric first to make sure the protector won’t discolor the furniture. 3. Hold it in place. A slight breeze can be enough to loosen cushions and a heavy wind can send them flying across the lawn. Keep all the patio pieces in place with Velcro®! Fasten half of the strip onto the chair and the other half onto the bottom of the chair cushion. To make sure your Velcro® halves line up, keep them fastened together when you attach the Velcro® to the cushion. Then, peel off the paper cover so the Velcro® meant for the chair is sticky, and set your cushion down. 4. Use furniture sunscreen. One of your patio furniture’s biggest enemies is a hot, sunny day. Just like fair skin, UV rays can seriously fade your furniture. If your furniture is metal or plastic, apply an even coat of outdoor furniture protector (a paint brush can make this job easier). If your furniture is wood, regular ol’ paint is the best way to protect it from the sun. The pigments in paint work like sunscreen, and protect the wood from harm. 5. Plan ahead. It’s not always possible to predict the weather. But, if you know extreme weather is about to hit your area (including a heat wave), go ahead and cover up your furniture or move it into a storage shed. 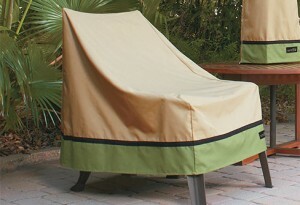 Furniture covers won’t do much against wind, but they will protect against damaging UV rays and torrential rain.